kerala sslc results 2015 is expecting on monday, 20th april 2015. kerala education minister P. K. Abdu Rabb will announce the same. once its published we can check the sslc results 2015. you can check the results at the website http://results.itschool.gov.in/ . you need to enter the register number and get the sslc exam results. you can also register your mobile number to get the results. to get sslc exam results on your mobile phone you need to register your mobile number. http://103.251.43.113/sslcresult/registration.php is website to register your mobile number. 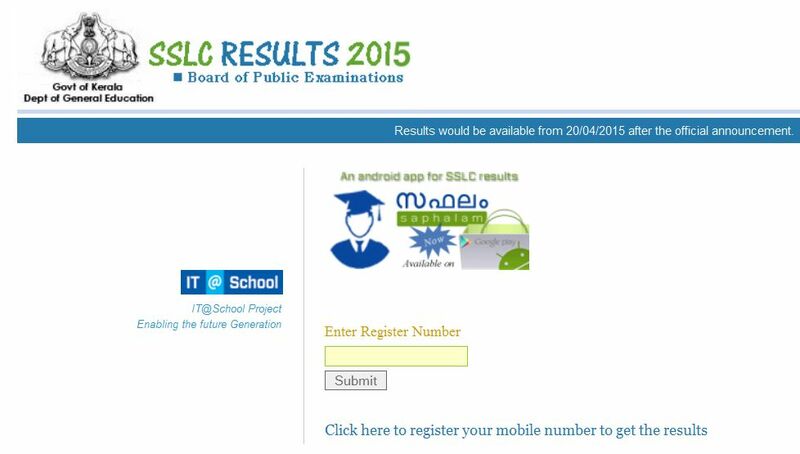 you can also check the kerala sslc 2015 exam results with the help of an android application. saphalam is the android app for checking the kerala sslc 2015 exam result. you can install the Saphalam android app from google play store and check the sslc 2015 exam results.